I was never really very good at that game Three Truths and a Lie, the one where (when you’re a slumber party or living in a dorm) you’re supposed to tell four things about yourself, three true, one untrue and have people guess the untrue one. I always play it with my students on the first day of any Introductory Sociology course, but often find myself slightly distorting both the truths and the lies. For example, I’ll say, for a truth, “My birthday is on May 4, the same day as the actress Audrey Hepburn. Which was a pure coincidence, but when I was in high school I started telling people that that’s the reason I’m named the way I’m named” — which if you believe the stories I tell here, is actually a lie, but makes, I would argue, for a near perfect Professor/Student anecdote. My father always exaggerated, everything, to the point where already by the age of four or five I knew he couldn’t be trusted to get straight information on anything, whether it was the day we would leave for vacation or if some story he told me about his childhood was true. To this day I do not know the actual name of the town where he was born. She panicked every time I became too submerged in some novel’s story and starting “living in the book,” actually worried that at the age of nine I needed therapy since I seemed preferred the divorced families of Judy Blume and Norma Klein novels to our own two-parent household (true) and at seventeen that because I loved Sylvia Plath’s The Bell Jar so much I should choose a university closer to home, in case I started considering suicide (untrue – by my senior year not only was I not suicidal, I was living as far away from the United States as I could possibly be — India). But my father was different. He seemed to always want a better story than the one I had actually lived (when I received my undergraduate degree he told people I had already finished a Masters and claimed I was a Professor when I had just barely earned my Ph.D). I know now that their two very different kinds of love, my father’s obscured by hyperbole, my mother’s salt of the earth, is the reason why today, as an adult, I make for a very good ethnographer, my chosen profession. Yesterday a colleague commented, “The way you live? Don’t you get exhausted? You make your whole life a field site.” I didn’t argue. Because with my little girl habit of making everything that happens to me a better or worse story than it was, while second guessing it a million times to ensure what really happened did happen, he was right. End Note 1: During my doctoral dissertation defense, three of the four Professors sitting on my committee to decide my fate took serious issue with my assertion that everything an ethnographer does in a designated field site “counts,” whether it is asking a subject a question pertaining to the study or sitting alone, ordering a cup of coffee during a break, eating lunch. It was the one point I refused to concede. 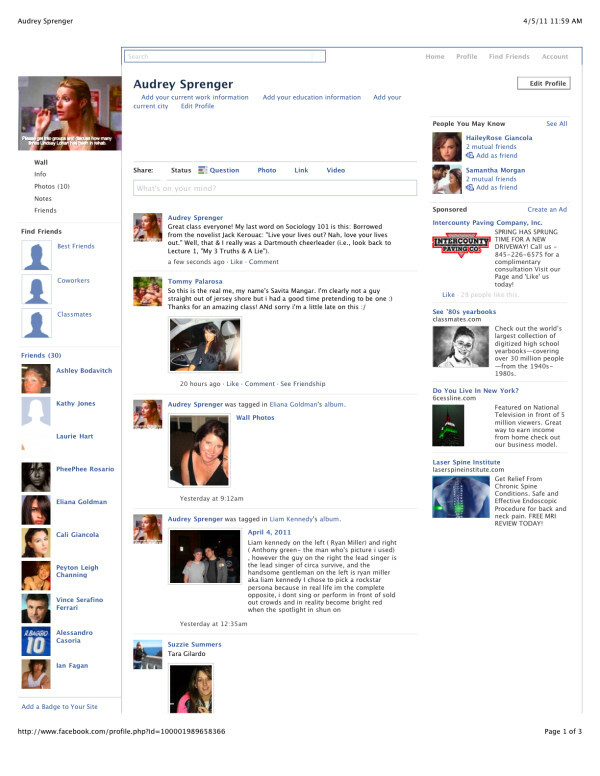 End Note 2: The image above is a screen capture from a project I assign in my Introductory Sociology course, where, over the duration of a semester, students create Facebook accounts based on a person (or identity), which is their ‘social opposite;’ family, friends and other social networks for the person they create; as well as regular day-to-day social interactions. Students also use the personas they create to interact with one another, revealing their ‘true,’ identity at the end of the course. I based this project on the film Catfish (2010), a smart, deeply engrossing film, which not only documents the narrative process by which people tell truths & lies in their every lives, but in the process of documentary/ethnographic filmmaking itself.